It’s tempting in the brazen, iridescent light of Baz Luhrmann’s all-singing, all-dancing Moulin Rouge (2001) to declare Jacques Demy’s Les Parapluies de Cherbourg as some kind of influential predecessor, a similarly song-saturated ‘grand-popera’. Or, perhaps more predictably, Demy’s ‘nouvelle vague’ masterpiece could be celebrated as a knowingly cross-Atlantic transposition of the best of the Freed-Unit Hollywood musicals, grafted onto a touchingly bitter-sweet Gallic romance: Minnelli and Donen-Kelly harmonizing with the poignant circularity of that most truly ‘musical’ of cine-auteurs, Max Ophüls. But such claims don’t really capture this singular film’s formal design or its ultimately un-romantic sadness. For starters, although its creator, punnily and poetically, defines his work’s special nature as ‘un film en chantè’ (1), as in a film that is done in song, Les Parapluies de Cherbourg isn’t truly a filmusical, let alone a celluloid opera, popera or even poperetta. The entirely-sung-through plotline of Demy’s tale of the brolly-selling shopgirl and the garage mechanic in a seaport town is performed essentially as recitative, except for a few, longer, more melodically soaring stretches of composer Michel Legrand’s major ‘lovers’ motif, (which, in English, became an Oscar nominated, chart-busting hit, called ‘I Will Wait For You’). So, most of what we hear on the soundtrack is the equivalent not of arias or of highlighted, tuneful ditties but a jazzily scored mesh of the ‘in-between’ bits that lead up, and into, and on from, those ‘bigger’ routines in operas and musicals. The movie sings its bitter-sweet, modestly scaled story via a distinctive potpourri of often quite matter-of-fact, mundane musicalized conversations, bringing it closer to a plaintively pitched, neo-realist daytime-soap. Such a strategy, in absolutely no way, diminishes or trivializes the unique status of the film, which significantly refuses to elevate itself to the loftily resonant realm of the tragic. Instead, it’s simply (or not-so-simply) sad. 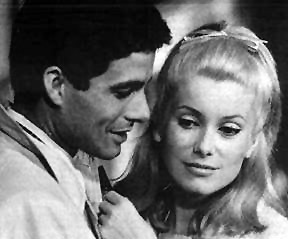 Catherine Deneuve’s exquisitely anxious Genevieve and Nino Castelnuovo’s handsomely vulnerable Guy are initially idealistic, ordinary people who end up having to settle, due to pregnancy and enforced separation, for ordinary solutions to the always risky gamble of taking a main chance on love. And it’s precisely around this pivotal narrative point that Demy, with a wondrously crazy self-referential courage, introduces his own previous classic, Lola (1961), and virtually critiques that film’s heroic romanticism by bringing it directly into rather sobering perspective up against the limited choices open to this particular star-cross’d and socially compromised pair. Finally, in the film’s famously chilling last scene, with the snow falling (on all of us? ), Demy and Legrand memorably counterpoint, through literal amplification, why, and how, this prospectively grand tragedy must stick (tragically?) to the minor key, played out in most of our human lives. While Demy’s openly acknowledged, inspirational mentor, Ophüls, might appreciate the neatly existential ‘realities’ of such a denouement, would his own dazzlingly diamond-hard diegetic universe ever match this peculiarly un-mysterious, un-radiant conclusion to a love story told like a song? Demy is also quoted as adding to that description of Les Parapluies… as a literally ‘en-chanted’ film, the equally important qualifier: ‘et en couleurs’. For, it’s in Jean Rabier’s lushly luminous, Eastman-coloured cinematography, in concert with Bernard Evein’s deliciously decorated set design, where the film all but visually ‘hums’ as a tonal symphony. Entire scenes display colour-coordinated characters, boldly and beautifully blending in with their surrounding environs and wall-papered interiors, in what often resemble Matisse and Dufy canvases, come magically and movingly to life, right down to a kind of vibrantly two-dimensional perspectivity. Here is a naturalistic world, constantly under the delectable threat of being surrealistically engulfed in a post-Fauvean, neo-Minnellian wash, without having to resort to gallery-framed other-ness or dream-fantasy sequences. By the time Genevieve and Guy, at the warbling’n’wailing height of mutually fervent adoration, begin actually gliding, and effortlessly floating along the backstreets of Cherbourg on the uplifting power of passion, it appears utterly physio-logical, the most natural thing on earth. And yet, it’s the down-to-earth grounding of certain cultural imperatives, and the restrictions of petit-bourgeois propriety, that eventually challenge and inhibit what the film’s sounds and images can only promise as emotional potentiality. Prejudicial fear and normative insecurities, especially in the elegantly middle-aged personage of Genevieve’s umbrella-merchandising mother, Madame Emery (a tenderly interfering Anne Vernon), are what build to form a chorus of sympathetically concerned disapproval, providing circumspect shelter from the on-rushing downpour of ‘l’amour’, which in the ‘real’ world of late 1950s/early 1960s France must never be permitted to become too overwhelmingly ‘fou’. Subsequently, the transcendent, sonically supra-diegetic delirium and madness of musicals and opera is not necessarily what can be truly associated with the Demy-monde of Les Parapluies de Cherbourg. With telling composure, no one in this film ever gets into a big spectacular dance number like they exuberantly do in the director’s next filmic foray, Les Demoiselles de Rochefort (1967). Rather, in this sweetly bitter fable about losing faith in the transforming, enduring enchantment of love, it’s the sad cine-song that triumphs, and not those once hopefully ardent singers.